Mix the veggies together to create a medley. Place the salami on the griddle with the tablespoon of butter and cook until warm. Layer half of cheese and the salami on one piece of bread and place on griddle. 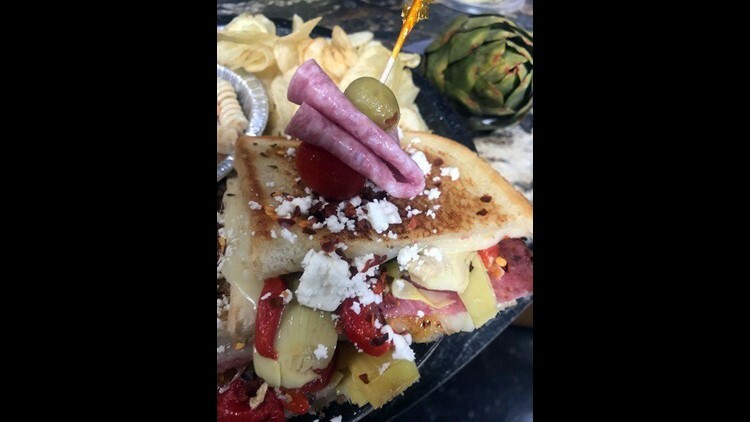 Place remaining cheese on another piece of bread and top with the red peppers/artichokes/ black olives/ banana peppers medley. Grill sandwich over medium heat until cheese is melted and the bread is golden brown. Top with feta cheese and crushed red pepper.